Yes, Aldi’s is my favorite supermarket since I was a little girl in Austria. There Aldi’s is known under the name of Hofer. I was ecstatic when they opened an Aldi’s down here in South Florida, and I have been shopping there ever since. Besides having the best prices they also carry a lot of certified organic products, gluten free products, earth friendly products – like cleaners and paper towels – and more and more Fair Trade products. Yes, there are Fair Trade Products at Aldi’s Supermarkets. Last year I used to buy Fair-Trade coffee all the time, but it only came in ground coffee and when we bought our Breville Barista it was more difficult to use. 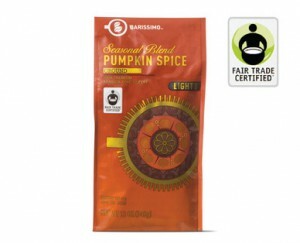 Last week my husband went shopping at Aldi’s and brought home Fair-Trade coffee beans. He brought 2 kinds – Fair Trade coffee from Peru and from Honduras. I made the Fair Trade coffee from Peru today and it is delicious. The beans have a full aroma and the coffee tastes earthy and fruity. It is not bitter or acidic, like many other coffee brands are. Besides having Fair Trade coffee, Aldi’s also carries Fair Trade chocolate, sugar and wine. If you have an Aldi’s nearby, check it out. I would put a link to the products, but they are weekly ads and by next week they are gone. So it is better to check your local store. You can support those farmers and get in turn delicious healthy products. We all should buy more Fair Trade products, so join me in support of these organizations that make sure that farmers get paid what they deserve.